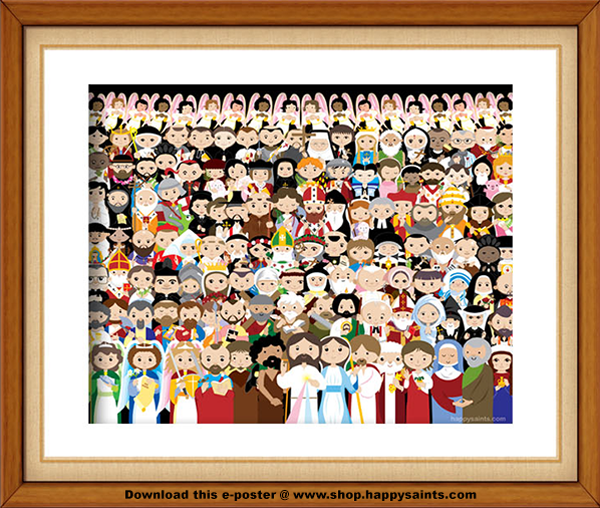 This special edition PDF e-Poster features a collage of 120 Happy Saints in a printable 8"x10" artwork, formatted in convenient easy-to-print US letterhead size (may be enlarged to tabloid size). A 'who's who' outline diagram is also included to reveal the identity of each Happy Saint. Fits standard 8"x10" picture frames when trimmed. Great as a wall art for all seasons! May be used to make cards and other paper crafts.